Sports Costs > How Much Do Gator Tags Cost? How Much Do Gator Tags Cost? Some states allow you to hunt alligators legally, but in order to hunt them, gator tags are going to be required. The price of gator tags will depend on the state and if you are a resident or non-resident. 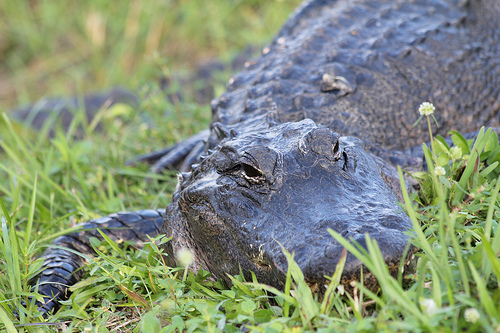 States where you can alligator hunt include Florida, Georgia, Lousiana, Mississippi, South Carolina and Texas. On average, a gator tag can cost anywhere from $25 to as much as $1,000 or more for an entire alligator hunting season. Each state is different with its laws. The permit will only be valid for a particular time period. In Louisiana, a sports license to hunt alligator during the season will cost around $25 for a resident. If you’re a non-resident, the license will cost around $150 to $200. According to the Department of Wildlife and Fisheries in Louisiana, the cost of a tag is going to be anywhere from $25 for a resident to $125 for a non-resident. In Florida, a license can cost around $1,000 for a non-resident, while a resident will pay around $250 to $350. In South Carolina, they only offer gator tags to those who enter a raffle. Those who get selected can purchase a permit for $100. In Alabama, alligator hunts are designated by zones. Those who are interested will pay a $22 administrative fee and can apply for one zone at a time. If selected, the tag will be free and hunters will need a valid license while hunting. The permit, along with the regulations and rules, will be valid for a certain time of the season. In Lousiana, for instance, a hunter must either hunt on their own land or leased land that is classified as a wetland habitat. The tag itself is used for the alligator if you successfully hunt one and is commonly placed around the tail. Once the alligator is killed, the tag will have to be applied to show that you have a permit to legally hunt it. In order to obtain a tag, the state will require personal information such as your name, an application, proof of property ownership if you’re going to hunt on private land, a map, a landowner’s signature and other related information. Each state will be different. If you’re planning on hunting private land, most states will require additional information such as a landowner’s signature as well as an outline of the area that is going to be hunted so it can be approved. It’s best to refer to the state’s official wildlife site to get more information. Most states may charge an application fee that can cost $10 to $30. This application is needed to process your permit. Those who live out of state will always pay more than a resident. Know the rules before hunting. For example, in Texas, it’s illegal to feed a free-ranging alligator. Open season depends on the state. In Texas, the alligator open season is April 1 to June 30. In Louisiana, the east zone opens the last Wednesday in August, and the west zone opens the first Wednesday in September. In Florida, it’s from August 15 to November 1. Lawful hunting hours are usually a half hour before sunrise to sunset. Most tags will be non-refundable. If the state uses a lottery system to choose its tags, the permits will be issued randomly and the winners will be notified either via e-mail or by mail. Try to hunt in a state that has the lowest alligator tag fees if you’re going to travel to do so. If you live in a state where the hunting is legal, a resident fee is a lot cheaper to pay rather than a non-resident fee. Only get the number of permits necessary for the hunt. Instead of purchasing two or three, consider purchasing only one. If you need more, many states allow you to go back and purchase more.